Beatrix Potter wrote this as a gift to a sick child and it was first published privately in London 1902. It is about a tailor who rescues some trapped mice from his cat Simpkin. The mice then repay his kindness by completing the work he cannot finish because he falls ill. 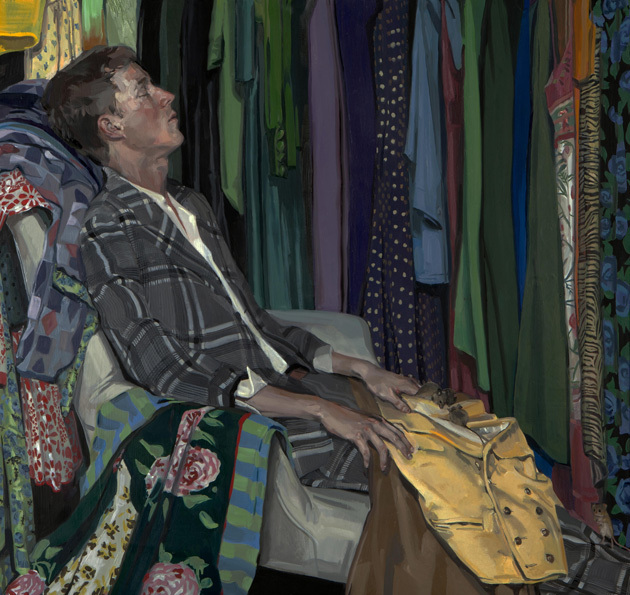 The colourful and crowded clothing all around the sleeping tailor hide the mice who are painted on his lap trying to help him. As a viewer we can only understand the hope in the story by taking notice ourselves of the small things – just as the tailor does by saving the mice. It is an example of children’s literature written to instruct and improve its audience with the promise of reward for good behaviour. The traditional happy ending, as shown in Simpkin the cat being ‘ashamed of his badness,’ gives us faith as good triumphs over evil. Dedicated to her former governess’s daughter ‘because you are fond of fairy tales, and have been ill,’ this story itself was created as an act of kindness. The maternal compassion Beatrix Potter shows for others people’s children reminds us that she did not have her own. She shows an affinity with children in her ability to capture their imagination in her detailed observational drawings, which give her books such popularity. She draws from life and adds to it – this tale is inspired by a real life incident of a young local tailor who encouraged the myth that his clothes were finished by fairies. Her version depicts him as an old man but the painting recasts him back to his youth so that the viewer can further empathise with his vulnerability and hopes for the future.